We request you to support 11 years old Alam Nasra. This child has undergone an Open Heart Surgery in June 2014. She was supported for surgery by Child Help Foundation. 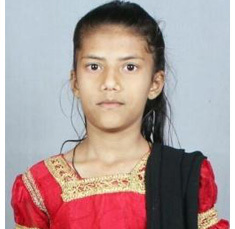 Alam is very intelligent and sweet Child studying in 6 th standard and doing well in her academics. Alam Nasra’s mother who is a single parent sells biscuits in her chawl and earns very little to fulfill their basic needs She wants to educate Alam Nasra and make her an independent child. She needs support for her education. Child Help Foundation depends on the generosity of individuals to offer help to Alam Nasra and educate this girl child and also help her to lead a healthy life with her regular medications.